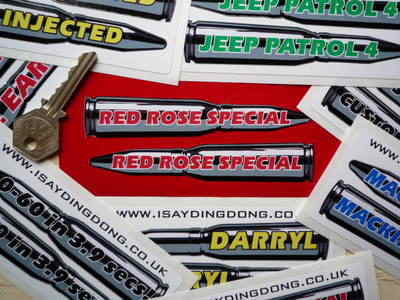 PERSONALISED Bullet Shaped Stickers. 4.5" Pair. 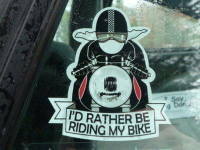 A pair of handed (one facing each way, for each side of your bike/car), machine cut to shape, bullet stickers. Just enter the text you want on your sticker (text must be the same for each sticker) when you order and we will get it printed for you. Remember the more you have written on your bullet the smaller the text will have to be. Text is available in either black, blue, green, red or yellow. Each sticker measures approximately 118mm x 20mm, and machine cut to a bullet shape. Stickers are cut to shape, the white/red square that you see is backing paper. 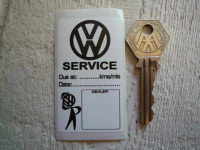 VW Volkswagen Black & White Service Sticker. 2.75". VW Volkswagen Happy Chappy Sticker. 5.5". Bosch Spark Plug with Bang Sticker. 6" or 12". 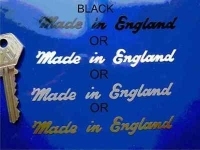 Made in England Sticker. Cut Vinyl with Black Outline. 4". Made in A Shed! Sticker. Cut Vinyl with Black Outline. 4". 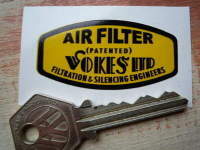 Vokes Ltd Air Filter Sticker. 2". 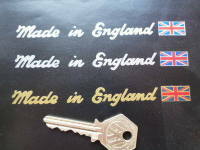 Made in England Sticker. Cut Vinyl & Union Jack. 5". Made in Italy. Yellow, Red, & Black Oblong Stickers. 1.5" Pair. 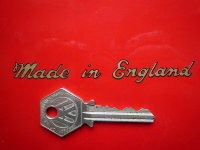 Made in England Sticker. Cut Vinyl. 4". 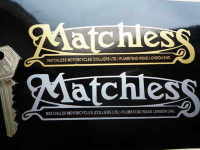 Matchless Mudguard Script Stickers. 5" or 8" Pair. 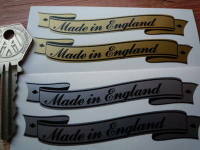 Made in England Scroll Stickers. 3" Pair.